Case studies make learning come alive. They tell a story. They mirror real life. They can also be actual experiences. They add elements problem-solving, complexity and messiness to thinking about the challenging world of public administration. Case studies let practitioners share knowledge, insight and cautionary tales of their own experience. They can help in avoiding the re-invention of wheels that often happens across governments. 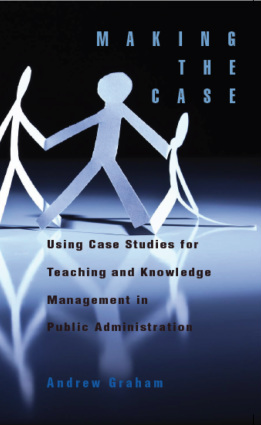 This book focuses on the use, writing and teaching of public administration case studies. It is book for teachers, but also for those in government who want to use case studies to share knowledge. It adds some high quality cases to strengthen the case that cases are important and useful tools. Case studies are attracting more interest both in teaching and in government. This book tries to give the pointers that will make creating and using them a success. You can purchase this book at McGill-Queens: Click here or on Amazon: Click here. This book is also available in Portuguese under the title Como escrever e usar estudos de caso para ensino e qprendizagem no setor publico published by ENAP, the federal Brazilian School of Public Administration, ISBN 978-85-256-0070-7.